Being a grandmother has its ups and downs. Today I would like to share an up for me!! The beauty of living in rich cultural Philadelphia is having The Free Library of Philadelphia as the catalyst to explore various cultures with their Sunday on Stage series. Sunday on Stage enhances reading about culture by bringing to life the images and instruments used by various cultures. I didn’t want to get up today, but knowing that I could take my grandson and his sister to our central library to learn about our culture was motivation. For there is very little to no history passing going on in my family gatherings. Exposure is key and I try to expose our youth and families to most everything good for us. Keepers of The Culture afrocentric storytellers performed as part of Sunday on Stage at The Central Free Library today. 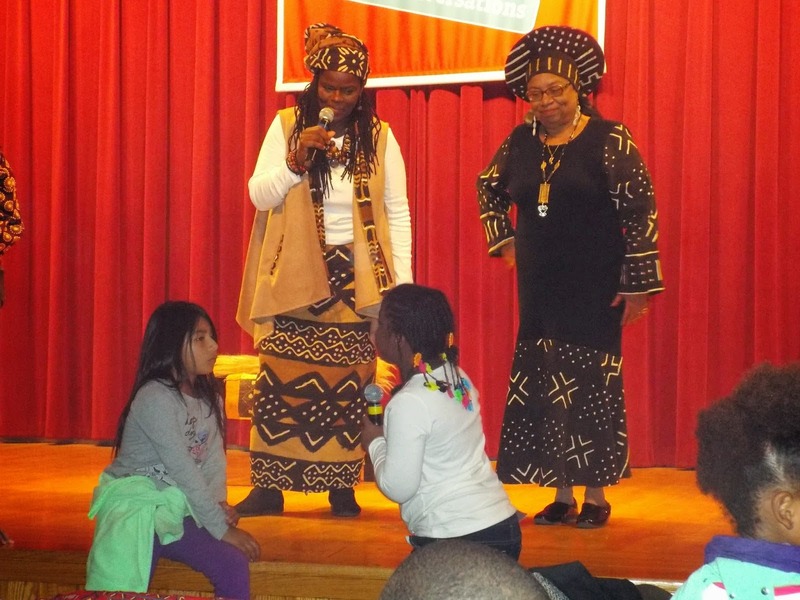 Keepers of The Culture captivated most of the audience with their interactive storytelling. My grandson is three years old and wasn’t able to enjoy the storytelling as much as he had enjoyed the music culture shared with us during Sunday on Stage featuring the Women's Sekere Ensemble. His sister Tahihya and I really enjoyed the stories and interactions. Tahihaya was so impressed that she signed up to be a youth story teller. After the performance we went to the children's library where my grandson likes to play in the learning through play section. While we walked to the children's library, TeeTee continued to talk about becoming a storyteller, she is truly excited. She said, "I am going to be famous and have fans like Beyonce in my audience." Then, TeeTee (short for Tahihya) logged on to the computer for 30 minutes while Aiden and I did some puzzles, built a city, read a book and learned how to use the mouse pad. We left the library and visited The Natural Academy of Science across the street. I absolutely love visiting The Academy of Natural Sciences and yes if you have an access card you can visit for $2 per person. I invested in my family with my tax refund and bought us a family membership that allows us access as often as we like. TeeTee and Aiden really enjoy earning a sticker for completing their Kids Club October Activity Sheet. But the best part of The Academy of Natural Science is that they always have cool ways to exhibit and teach us. Today we explored clams, hermit crabs, mussels and other underwater life. i never really know what the exhibits will be, we just go knowing there is something cool going on at the academy. 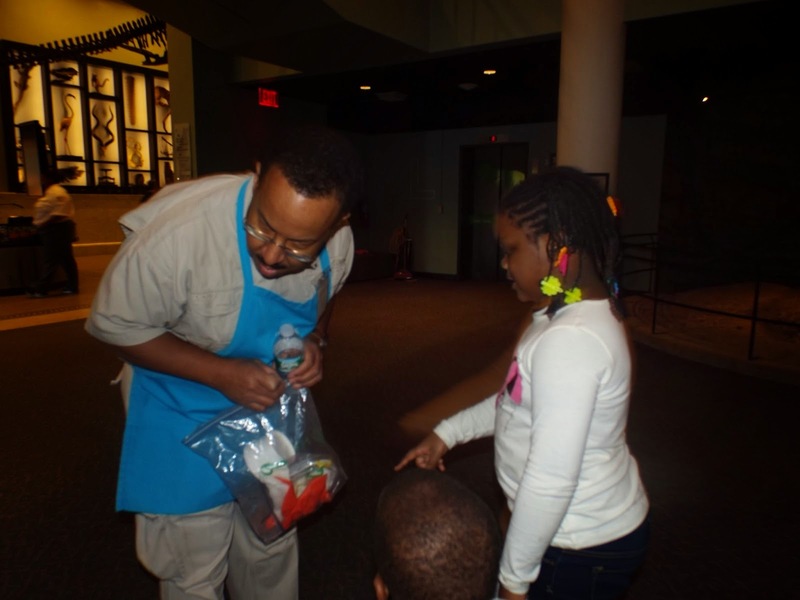 TeeTee holds conversations with the experts in the field of science while Aiden listens. 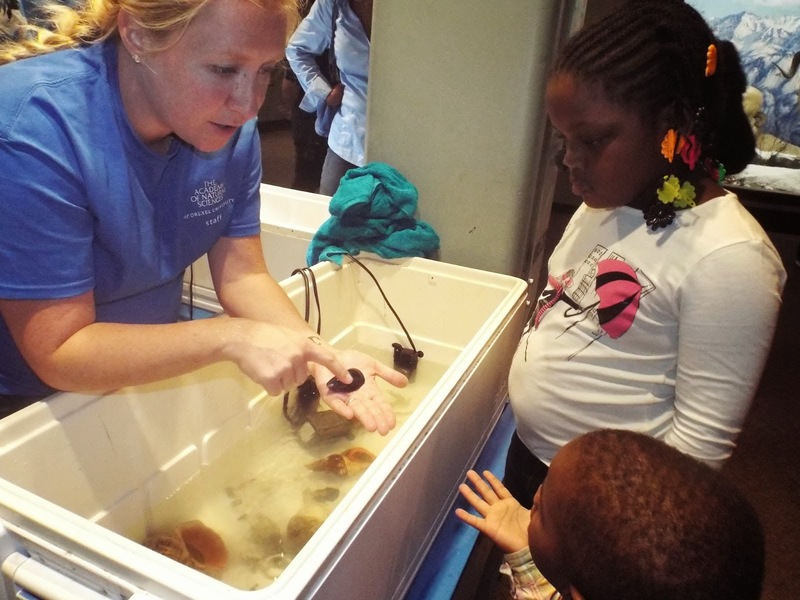 Get more information about the Academy of Natural Sciences here. Exposure is the key to growth!! "Telling Our Story, Claiming Our Glory!" Keepers Of The Culture, Inc. KOTC, or ("Khotsi") of Philadelphia is a non-profit, educational, cultural art organization which seeks to perpetuate the African and African-American oral tradition. We recognize that traditional African storytellers - griots - were the true "Keepers Of The Culture." Their role as historians of the community helped people maintain a strong, positive sense of self and a clear understanding of the values of the community and the individual's role in the community. The griot presence insured that the history, culture and values of a people would be passed on in their own words. We intend to highlight, reinforce and pass on the history and culture of African-Americans and their antecedents, to educate and nurture individual and collective self-esteem and foster pride of culture in our community-especially in our children. Our objective is to do this by offering performances, workshops, seminars, mini-festivals and collaborations with other cultural arts organizations and artists of various disciplines in the Philadelphia area. Beginning this fall, ACCESS Cardholders (those Pennsylvania residents who monitor their government issued cash and food benefits with an EBT card), are invited to visit participating museums, science centers, gardens and historic sites at a deeply discounted rate. Similar to the reduced admission offered to students, senior citizens, and military professionals when showing proper identification, ACCESS cardholders will be able to do the same, and enter participating venues for just $2. Seventeen local cultural venues are on board, and excitedly awaiting your visit this Fall. To learn more about them, visit the “Museum Partners” page to the left! ACCESS Admission is a city-wide initiative led by Art-Reach, supported by various community partners, and proudly sponsored by The Barra Foundation and PECO. NOTE: Visitors must present a valid ACCESS Card along with a photo ID to receive the discount. One (1) ACCESS Card admits up to four (4) family members at a rate of $2 per person. Admission is to be paid by the visitor, not through their EBT card. The ACCESS admission discount is not valid on special exhibitions or features, or with any other offer or group rate.